If you want to put a unique spin on a classic recipe, a pretty surefire way to do it is to work in some mezcal. The deep smokiness gives just about everything a delicious facelift if done right. I see mezcal variations popping up all over the place: mezcal mules, mezcal palomas, mezcal sours, mezcal juleps... I recently featured a Mezcal Smash and even attempted a mezcal Manhattan. But, as I learned while trying to come up with the Manhattan recipe, it's not always so simple as replacing the base spirit with mezcal. This is even more true when it comes to the Old Fashioned. The Old Fashioned is the original cocktail, and it's a simple one at that. Spirits, sugar, bitters. Modifying it requires a certain amount of subtlety. But this variation puts a nice, agave-centric spin on the classic. With tequila reposado, mezcal, agave nectar, and mole bitters, it sticks to the formula of the Old Fashioned without actually keeping a single ingredient. 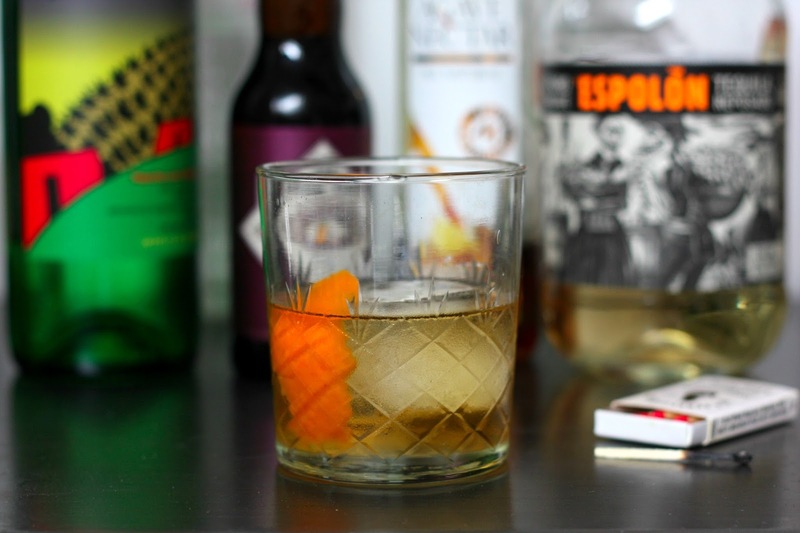 The Oaxaca Old Fashioned also calls for a flamed orange twist. Flaming a twist is something I didn't mention in my post on twists. Maybe I should have, because it's fun, dramatic, and actually educational - it gives you a really clear view of the oils expelled from the twist, which are usually all but invisible. It does not involve lighting the twist on fire; instead, the oils pass through the fire, giving them a nice caramelized flavor. It does require you to be a bit more ambidextrous than the usual twist. First, strike a match and hold it over the glass in your non-dominant hand (being careful not to panic and drop it into your cocktail if it burns too low). In your other hand, pick up your orange twist with the outside facing the match. Hold the twist between your thumb and middle finger or forefinger and bend it in half by bringing your fingers together. The ends should bend towards your hand, the middle out towards the drink. You should see little flickers as the oils are expelled and pass through the flame into the cocktail. Blow out the match and rub the peel on the edges of the glass when you're done. History: The name of this cocktail is a reference to the Mexican province where most mezcal is made, Oaxaca. It was created by Phil Ward at Death & Company. Ward left to open Mayahuel and create many more delicious mezcal and tequila cocktails, such as the Division Bell. Combine all ingredients in a mixing glass with ice and stir until chilled. Strain into an old fashioned glass filled with ice. Garnish with a flamed orange twist. Note: Other versions of this recipe use Angostura bitters instead of mole, and some omit the flaming of the orange twist. Recipe adapted from Imbibe and Kindred Cocktails.